Breaking: Illegal Migrant Caravan Invading the US Today! Last week, a thousand migrants violently rushed the border. They began pelting Border Patrol agents with rocks and actually tore steel panels off of the border wall. More than 60 illegal aliens were able to get through the border fence before agents used tear gas to push them back. Now, the caravan organizers are going to do it again. They are rushing the border TODAY. Congress has just six days left to pass the President's border wall funding, but you can hardly tell by looking at what is happening on Capitol Hill. There haven't been any committee votes... no mark-up sessions... absolutely no progress. The GOP is telling Trump that they just don't have enough time to fund the border wall. They are telling the President that he will have better luck negotiating with Nancy Pelosi... This is disgusting. We are running out of time. If Congress does not fund the border wall by the end of the week, the project will never happen. Rise up and fight before it's too late! Last week, a thousand caravan migrants tried to rush the border. They started tearing steel panels off of the border fence in order to break into the country. During the invasion, more than 60 migrants got in and started pelting Border Patrol agents with rocks. The only reason hundreds of people didn't get through is because the agents deployed tear gas. The caravan isn't finished. They are launching another stampede at the border checkpoint today and are promising that it will be bigger and more violent than the previous attempted invasion. The only things stopping these thousands of migrants are a couple hundred border agents and a dilapidated border fence. And yet, when I look at Congress, I don't see anything being done to fix this. The spending bill deadline is December 7. That is less than a week away. In just six days, you must pass a new spending bill to fund the Department of Homeland Security. The President has threatened a government shutdown if his $5 billion border wall funding is not approved. You and I both know what is going to happen. Either Wednesday or Thursday, both Paul Ryan and Mitch McConnell will say they've run out of time and need to pass a continuing resolution instead of approving new border wall funding. They will turn to the Left and ask for Democrats to help passing a bill that once again outlaws border wall construction. I need you to know this is unacceptable. 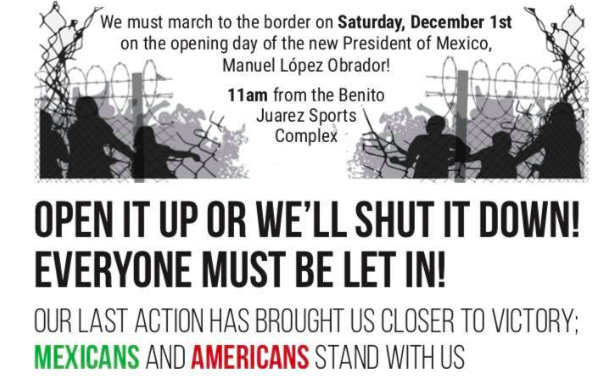 This could be your last chance to secure the border. So why are you squandering this chance? There will be hell to pay if you let this opportunity pass us by. You MUST kill Paul Ryan's surrender continuing resolution and stop it from reaching the floor. Under no circumstances can you allow the provision blocking border wall construction to be renewed. Then, you need to pass the President's immigration agenda and finally secure the border. That means boosting Border Patrol's budget, allow for new hiring and detention facility construction, and finally fully fund the border wall project. That is your only option. Anything else, and you will be removed from office. The caravan is making another attempt at invading the US today. If you will not do everything in your power to protect the American people, I will make sure you regret it.